Waterskiing is one of the original tow sports, and for many still the only real way to have fun behind the boat, with waterskiing still being one of the more popular tow sports to learn and with the Hamptons being the melting pot of nationalities that it is know to be, it is only natural that we get a large amount of demand for both waterskiing and single ski charters and lessons. Or as the french enjoy referring to it ‘mono ski’! Noyac Bay and the surrounding are can create some really beautiful flat conditions, perfect for throwing on some skis and carving around behind the boat. Our location at Mill Creek Marina is a centrally located on the fringe of Sag Harbor right by popular Long Beach on the bay side, after picking you up, signing some quick waivers and idling out of the channel, we will go find the flattest water and then show you just how flat the 2018 Malibu VLX wake can really get. 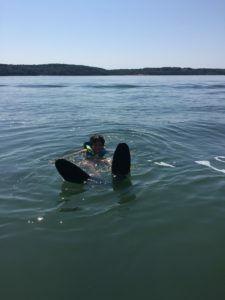 If you, a friend or a loved one wants to start their waterskiing adventure, our captains specialize in getting you to the level you want whilst remaining safe, our boats come with waterskis but they are also equipped with wakeboards, wakesurfers and a tube so you can switch it up and give everything a try. 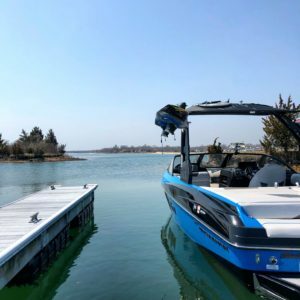 Get in touch with us today to book some summer time on the water, there is no better way to introduce yourself or your children to the fun of waterskiing and enjoy Peconic Bay and the East End in process.